You are here: Home / Health / Chickweed Tea: A Potential Herbal Cure For Obesity? Drinking chickweed tea might help you lose weight. Especially if your weight gain is caused by hormone replacement therapy or progesterone creams. There’s research to support the use of this herb for its anti-obesity effects and other health benefits. Is weed the answer to weight loss? Rather, “starweed,” the bane of many a gardener, may help normalize fat metabolism. Better known as chickweed (the Latin botanical name: Stellaria media; S. media), as a plant, it’s basically viewed as a weed or invasive species. However, the herb shows promise as an ingredient in anti-obesity drugs. There are several herbal teas you slim down. This website has featured several of them, including: moringa, sumac, Wu-Long, and matcha green tea. S. media might just work as a weight loss tea. However, the only group benefiting from it thus far in research studies are mice. In particular, albino mice. Studies on herbal remedies need to be taken with a grain of salt for this reason. However, keep in mind that it’s very expensive to run a proper clinical trial with humans. And it’s unlikely that anytime soon, a pharmaceutical company with deep pockets will fund a large study on chickweed tea for weight loss. And S. media demonstrates that it can be used in a future anti-obesity drug that’s safe. Is your weight gain due to a hormonal imbalance? Particularly estrogen dominance? Then drinking a herbal tea with star weed may help normalize your weight. Your level of progesterone, a female reproductive hormone, increases during the later phase of your cycle. An excess of it has been linked to eating disorders (and mood disorders, too). There’s also evidence that using birth control pills, as well as creams with progesterone and other forms of hormone replacement therapy may cause a significant increase in weight. And not the good kind, which is an increase in lean muscle. Rather, excess progesterone levels can cause your body to accumulate more fat. And, as this research shows, chickweed tea may counteract the effects of excess progesterone (at least in female albino mice). The study analyzes how much the mice ate as well as changes in their body weight, rate of thermogenesis, and fat metabolism. How did S. media fare in the study? The researchers conclude that it prevents the increase in body weight. Moreover, it decreases the weight and size of fat tissue. It’s fairly important to note that this study proves the benefits of chickweed are derived from methanol extract. Not alcohol extracts. Methanol extracts seem to better preserve the beneficial compounds in this herb. So what makes drinking chickweed tea a potential weight-regulating herbal remedy? Rather, having anorexic property simply means it curbs your appetite. The herb contains at least a couple types of beneficial antioxidants: saponins and flavonoids. Beta sitosterol is plant sterol. Plant sterols are like the cholesterol of the plant world. In fact, they have a similar structure to the cholesterol you get from eating animal products. And eating foods with beta sitosterol has been shown to reduces fat absorption in the body. It even reduces levels of cholesterol in the blood. Furthermore, the study above on the albino mice show that chickweed extract reduces the size of fat cells. There may be other benefits of consuming S. media. Either as a tea or as an herbal extract. Limited evidence suggests it can help with inflammation in the digestive tract. It may also benefit the kidneys and lungs. A 2012 study from China suggests it can treat dermatitis and other skin diseases. In fact, traditional herbalists use it as an astringent to help heal the skin. In addition, if you have bad gas, drinking a cup of tea might help. Herbalists also use it to treat asthma. Other health benefits of chickweed tea may include calming inflammation of the mucous membranes. It may also act as diuretic, encouraging urination. And if you have excessively low bleeding during menstruation or experience pain, it may help normalize your cycle. Not only that, but it acts as an expectorant. Expectorants are great if you have a nasty cold. Breastfeeding moms may find drinking this tea useful; a traditional use for it is increasing breast milk production. And the list of benefits for chickweed goes on…. And similar to comfrey oil, it may be used as a poultice to heal cuts, burns, and bruises. But wait, there’s even more health benefits…. Chickweed may help kill viruses. Especially, according to this research, hepatitis-B virus. This perhaps make this herb a good alternative to hepatitis B vaccines given to newborns shortly after birth. And here’s one more potential benefit: this research suggests the genes in S. media show promise for preventing disease in certain crops. If you’re wondering where you can buy this therapeutic herbal tea, here, let me Google that for you. You can easily buy chickweed tea bags online. And the good news is, according to the Environmental Working Group, it’s safe. The well-regarded EWG’s Skin Deep rating system says it’s a low hazard. Can You Use Coconut Oil For Weight Loss? What’s the Best CLA Supplement for Weight Loss? 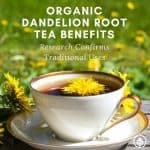 Organic Dandelion Root Tea Benefits: Science Backed? Green Coffee: Any Proof It Works to Improve Health?